This article was first published on November 7, 2016 and updated in January 2019. Most people would take advantage of the coming Lunar New Year holidays to squeeze in a quick getaway. But for those who were too late in booking (yes, you do need to book Chinese New Year flights during the previous summer!) or for those who will be visiting, here are a few things to do during Chinese New Year in Singapore. TIP: here is everything you need to know about the Chinese New Year legends and traditions in Singapore and when the festivities are done, continue your exploration of the city with this list of over 100 things to do in Singapore. Firstly let me warn you: I spent the last three Chinese New Year holidays in Singapore and oh-boy I regretted it. Unless you are looking for the Zombie Apocalypse Ghost-town experience you better get away. The city goes quiet to a level that is only seen in Wild West movies. Almost all the stores are closed and supermarkets even empty their shelves on the days preceding it in preparation for 4 days of complete shut-down so stock up on food – unless you plan to eat in Little India every day. So in an attempt to find ways to experience this very interesting time of the year in the city, here are some tips on what to do during Chinese New Year (also known as CNY) in Singapore and the days of holiday that follow day 1 of the Lunar New Year. If you haven’t gone down to the bustling market stalls lining Chinatown’s Temple Street and Smith Street, you haven’t experienced the true Chinese New Year in Singapore atmosphere. The street market is open till the evening of Chinese New Year, so head down to sample the goodies. I hear that most stalls will start to offer discounts or freebies nearer to closing time. It will be like trying to squeeze in last minute shopping on Christmas Eve, so get ready to push and haggle. It is custom to do a few rounds of visitation during the Chinese New Year festival, these are usually called Reunion meals by the locals. Besides being a good time to catch up, share a meal and learn more about the Chinese culture, you’ll also be able to indulge in a traditional game of Ban-Luck, also known as Chinese black jack or 21-point. The Chinese like to gamble during Chinese New Year because they believe that gambling during a new year brings in fresh luck. If you aren’t sure how to play, get your host to give you a quick run through with the rules of the game, and you’ll be off in no time. Don’t forget to bring two oranges to exchange with the host if you want to receive some red packets stuffed with money! And remember your to-do for this year: make a friend who celebrates Chinese New Year in Singapore for the true insider experience. Ever wondered what goes on behind the wrought iron gates of The Istana, the official residence of Singapore’s president? If you ever wondered where to go during Chinese New Year in Singapore, the house of the President is a good option. We are not kidding. The grounds of the presidential residence are open to the public during major holidays, and you’ll get a chance to visit on the second day of the Lunar New Year. For a small fee, visitors can also get privy to the special rooms used for presidential functions and services. There are also free walking tours of the estate, and you can enjoy the cultural performances out in the lawn while munching on a your picnic food from home. Embrace the different cultures in Singapore by visiting the cultural quarters of Little India and Kampong Glam. These areas are the hub of the Hindu and Muslim community respectively, but are home to religious centres of other faiths and origins as well. As most of the Chinese part of Singapore will be closed, these two enclaves are your best bet for food. In Little India you can visit Mustafa Complex a 24-hour mall open all day everyday, where you can buy anything and everything, you have never seen something like it. You’ll be able to grab anything ranging from a head of cabbage to a pair of new sneakers at a fraction of the price. While you’re in the quarters, take some time to appreciate the various architectural styles of the famous Sri Veeramakaliamman Temple. You’ll also be able to get a taste of the best Indian food in Singapore along the streets. You can also pop by Kampong Glam, which is in walking distance. Haji Lane which is in the area has the reputation for being the ‘coolest’ neighbourhood in Singapore, housing boutiques and ‘hipster’ eateries side by side with cultural landmarks like the golden-domed Sultan Mosque and the Malay Heritage Centre. Parks don’t know about holidays so one of the best things to do in Singapore during Chinese New Year is to make the most of the open spaces and the thriving nature. As most other parks, MacRitchie will be open during this time and since most Chinese people will be home with their families it will be a great occasion to have the park all to yourself. There are advantages to zombie-town! Ok, so almost all businesses will remain closed during Chinese New Year. But! Some of them are smart enough to capitalise on the laziness of others and will offer special celebratory meals, especially hotels which need to remain open for their guests regardless. 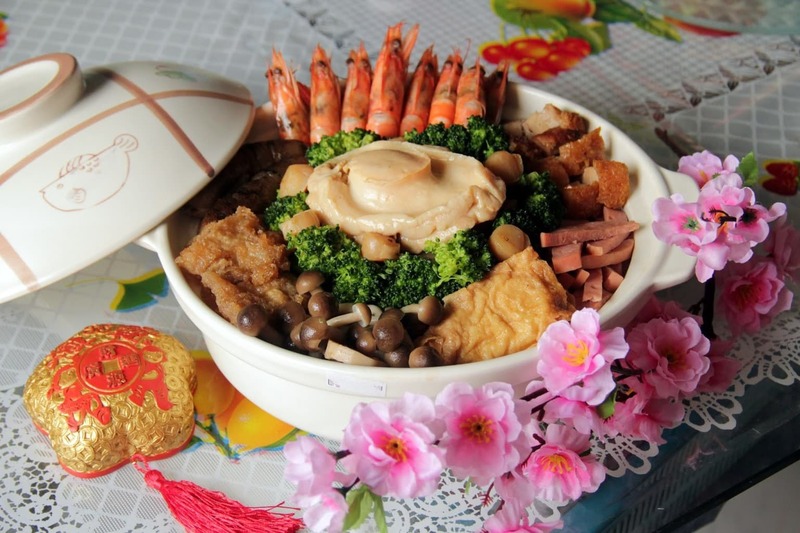 For a true Chinese New Year experience, sample authentic favourites like fatt choy, black moss, and peng cai, a ceramic pot filled to the brim with luxe ingredients like pork, mushrooms, prawns and scallops which are stewed over a few days to bring out the flavours of each ingredient. Most hotels and some restaurants will be open on Chinese New Year Day, but make your reservations early, especially if they’re popular places! Singapore is never extremely crowded but Chinese New Year is a great time to visit all the places that may usually attract a crowd, as most of the locals will not be there. Think the beach, the parks, the main landmarks, etc. All those will be great options to take in the atmosphere without the noise. It is an opportunity to go up to the Observatory on top of Marina Bay Sands, to watch the light and music show at the Marina Bay Shoppes walk or at the Gardens by the Bay. Or you could go up the suspended bridge at Gardens by the Bay without having to queue. And don’t forget to snap that photo at the Merlion without most of the photobombing that usually goes on. 2. If you need to take a cab during Chinese New Year be ready to wait. As Chinese drivers will not be working only Malay or Indian drivers will, so the supply will be significantly decreased ad prices will go up. One year I got completely stuck having to fly out on the last day of Chinese New Year for work at 5am and I barely made it!